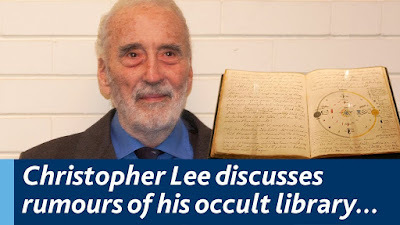 Among the "occult" books he said he did possess was a signed copy of one of my own personal favorite horror novels by Dennis Wheatley, titled The Devil Rides Out, published in 1934. It's not odd that he would have this book in his possession however, since he starred in the film adaptation of this book in 1968 through Hammer Studios, in one of his more heroic roles when he exposes a satanic cult and saves a girl kidnapped by satanists, defeating the devil in a ruined monastery in Greece. In one interview, he said that this was his favorite role and one he would have liked to reprise in his latter years with modern technology. Unfortunately, no one took him up on this offer.